Huntington's Disease - Causes, Symptoms, Diagnosis and Treatment! Huntington’s disease was earlier called as Huntington’s chorea. It is an inherited disorder affecting the brain cells. Huntington’s disease effects on the brain is permanent damage of the brain cells. The disease begins as lack of muscle coordination and poor mental abilities. But as the disease advances, jerky movements and unsteady gait become more pronounced. The disease begins mainly around middle age that is between 30 to 50 years of age. Genes are present within the chromosomes in each living individual. These genes carry the vital information that is required for normal functioning of the body. In this particular disorder, the mutated gene is present on the chromosome 4 which normally produces a protein called huntingtin. This gene no longer produces the protein as a result of which the brain cells get permanently damaged. Huntington disease is a genetic disorder that is inherited in the autosomal dominant gene mutation. This means that if one parent has the mutated gene, there is 50% chance of the child to inherit the disease. The inheritance of huntington’s disease is genetic and it does not skip generations. So if a child does not inherit a faulty gene, he will not develop Huntington’s disease and will also not pass it on to his next generations. If the child does inherit a mutated gene from either of his parents, he will develop the disease when he reaches middle age. Balance and coordination are affected which make the patient clumsy. In the initial stages of the disease, the person may not be aware and so all the symptoms may be taken as a change in the behaviour and attitude by friends and family members. Unexpected temper outbursts may occur in a person who is otherwise very calm and composed. These may be shocking and at the same time very distressing. If any such abnormal behaviour is seen, you must consult your general practitioner for further investigation. 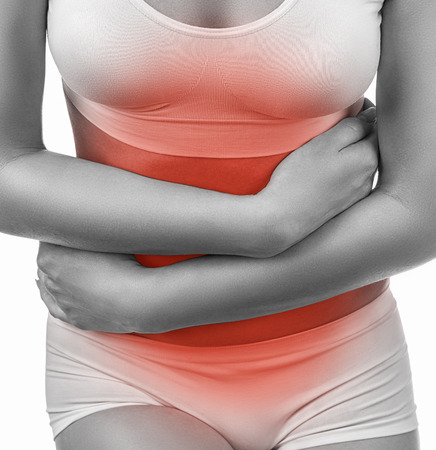 With the progression of the disease, the uncontrollable movements become more pronounced. There is jerking of various parts of the body and fidgety movements of the extremities. The person becomes clumsy and drops things from the hands often. With passing time, the jerky movements become more intense. Swallowing becomes difficult as the muscles of the mouth and throat get affected. There is a risk of choking and the person finds it more difficult to swallow fluids as compared to food. The person may even spill the food from the mouth. Emotional changes and symptoms of huntington’s disease like anger, depression and lack of emotions become more and more evident. In the last stage, the jerky movements intensify and then gradually slow down as the muscles get rigid. In the final stage, most of the patients need to have full time help or nursing aid in order to assist them with day to day activities. There is loss of cognitive power and the memory also gets affected. Weight loss occurs in most of the cases which also weakens the immune system and makes the patient more prone to getting infections. Medical symptoms are added to those of the disease. Most patients with Huntington’s disease die of complications like heart problems, pneumonia, chocking and infections rather than the disease itself. The first step of the diagnosis is complete history taking. The doctor will examine the patients history in sequence of appearance of the symptoms, medication history etc. The presence of mental and emotional changes is examined by questioning the family members about the same. Imaging techniques may be used to rule out other disorders. (a) Genetic Testing: Genetic testing for huntington’s disease is carried out for those who have a family history of the disease. In many countries the minimum age for genetic testing is 18 years. If a faulty gene is detected, the onset of disease can be predicted. (b) Testing in Pregnancy: Genetic testing can be carried out during the 11th week of pregnancy. Genetic testing is a must if there is a family history of any kind of genetic disorder. In case of in vitro fertilization, the gene of the mother has to be tested before going for the implantation process. The fertilized egg can be implanted only if the mother is found healthy. (c) Imaging Techniques: CT scan and MRI scan done in the early stages of the disease show atrophy of the caudate nuclei in the brain. 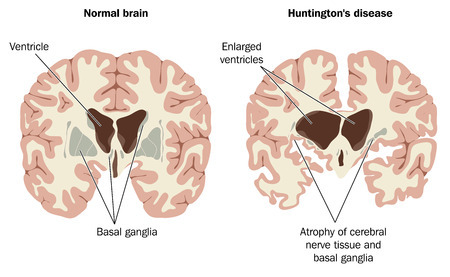 Changes of cerebral atrophy are seen in the later stage of huntington’s disease. These imaging techniques mainly rule out other medical conditions and are used for diagnostic study of such cases. For patients looking for Huntington’s disease cure, the news is grim. This disease is incurable and the main aim of the treatment is only to slow down the progression of the symptoms and help the patient to function independently despite the disabilities caused by the disease. Huntington’s disease medications like tetrabenazine are used to control the involuntary movements. However there are side effects like drowsiness, nausea and restlessness associated with these drugs which need to be monitored carefully. Speech and language therapy is useful for patients with difficult speech or swallowing problems. 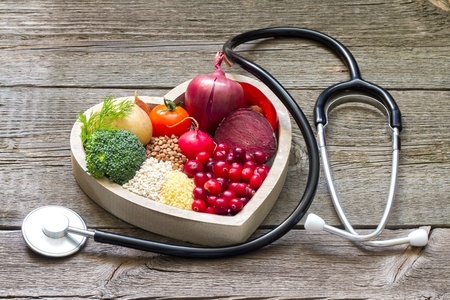 Proper diet and nutritional supplements are helpful in dealing with the weight loss associated with Huntington’s disease. Physical and occupational therapy are useful as the therapist teaches you methods to prevent falls and take control of the movements. Cognitive power and memory can also be improved with the help of occupational therapy. Research is going on in the field of gene therapy where scientists are trying to make man made molecules that can prevent human cells from making abnormal proteins and thereby blocking the progression of Huntington’s disease. In each stage of the disease, the role of the care taker is very important as the patient looses the ability to function independently. The caregiver could be a nurse or a family member. It is advisable to be a part of some social groups that are made for patients with such diseases, so that taking care of the patient gets easier.